The Professional Staff at The Counseling Center are dedicated, expert therapists who volunteer their service out of a sense of love and personal mission. Each therapist also has a private practice elsewhere, and one of the requirements of the staff is that their work at The Counseling Center is NOT their primary source of income. When you call the Center, you will reach a 24-hour answering service and your call will be promptly returned. 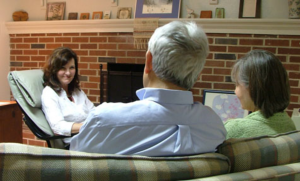 You will be interviewed, and a TCC Director will help you choose the therapist best suited to your needs.